Wifi Collector is an application for Android that collects information about wireless networks and their location while you're walking on the streets or driving your car. For every wireless network, the following information is collected: network name (SSID), MAC address of the access point, company that manufactured the access point, signal level, channel frequency, channel number, security (WEP/WPA/WPA2), WPS support (Yes/No), Date/Time that the network was detected, and the location of the wireless network (Longitude and Latitude) taken from the GPS. After collecting the wireless networks information, you can export it into csv file, tab-delimited file, HTML file, or .kml file of Google Earth, which allows to view the location of all collected networks on a map of Google Earth. The usage of both GPS and the wifi component by this app is quite intensive, so while using this app, your battery will be drained much faster than usual. Don't forget to click the Stop button when you want to finish collecting the wifi information. This app is completely free for any kind of use. It will not display ads and it will not send any information from your device. Download and install the apk file from this link on NirSoft Web site. Be aware that downloading and installing directly from NirSoft requires to enable installations from unknown source. In order to start collecting wifi information ,simply click the Start button. While collecting wireless networks, Wifi Collector shows the current status on the screen, including the total number of networks collected, the current location retrieved from the GPS, and the current number of GPS satellites that are used to calculate the location. After finishing collecting the wireless networks, click the Stop button, and then you can use the Export menu to export the collected information to CSV, Tab-Delimited, HTML, or Google Earth file. 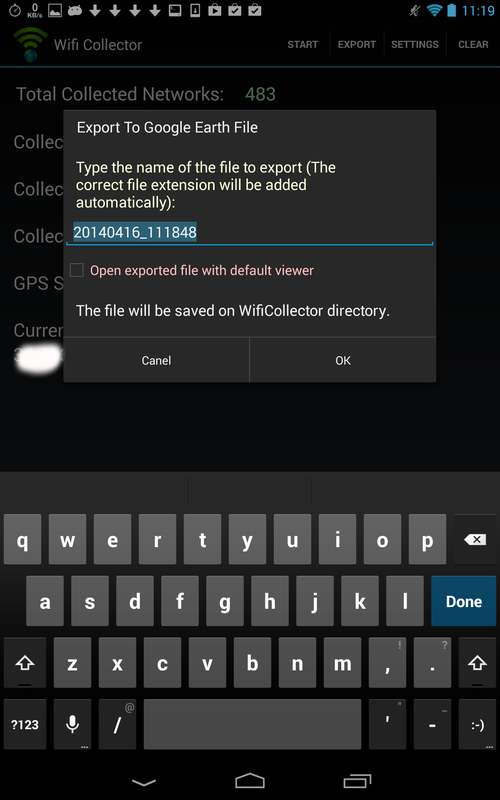 All exported files will be saved on WifiCollector directory on the shared storage area of your device. There is also an option to instantly open to exported file with the default file viewer on your device. 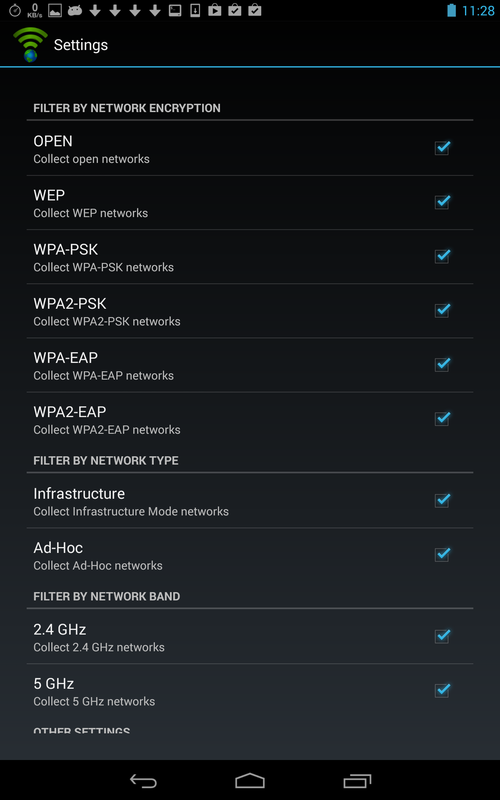 By default, Wifi Collector accumulates all networks detected by the Wifi component of your device. 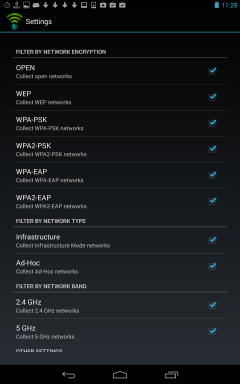 In the settings of Wifi Collector, you can choose to filter out some of the networks. For example, you can choose to collect only open networks or collect only networks with high signal level.